Firstly, we don’t have a deep fat fryer, so we used the saucepan method. While this worked fine, I did freak myself out by reading something online that included the word ‘combustion’. Needless to say I was then panicking all through the cooking process in case the oil got too hot and exploded – this didn’t happen, but I think I’d be happier cooking in a deep fat fryer next time. Just for my own piece of mind! But frying the pork was fine, really easy, once you got used to how long the meat needed. We did cut up the first few pieces just to check that they were properly cooked. The actual problem we had with this recipe was the sauce. The problem happened when we started to stir the sugar – apparently you’re not meant to stir sugar while melting it – oops! Anyway once the sugar finally melted we went to add the next ingredients and this is where things went wrong. As soon as the juice, wine and soy sauce were added they reacted with the sugar, causing steam and sizzling which left us with a hard clump in the middle of the pan – eek! I don’t really know what happened, maybe we added them too quickly or maybe things were too hot – but whatever happened was very weird and certainly not the way the recipe was meant to go. We managed to salvage the sauce by removing the odd clump of hard stuff and luckily the rest of the sauce was okay, so after decanting to a new pan we finished the sauce instructions without further issues -phew! We did however burn the pan beyond repair! Luckily, as I said we did salvage the sauce and we were able to finish the recipe and served up a delicious meal of sweet and sour sauce and rice. The verdict – it was delicious, the perfect amount of crispy batter paired with beautifully cooked pork and a delicious sweet and sour sauce. Honestly I’d definitely make this again – I’d quite possibly look for a different sauce recipe or (dare I say it) just pick up a jar from the supermarket! If anyone has any explanation as to what we did wrong, do share, as I hate not knowing! So unless you’ve got your eyes closed you’ve probably already noticed this but we’ve got a bit of a new look on CB&E. We’ve been wanting to change things for awhile and thought what better way to start the new year than with a brand new and sparkling new design. And I know the beginning of the year was ages ago now, but it’s taken us this long to decide what we wanted to do and to get it done. Luckily we have a wonderful friend Claire who is a whizz with design and photoshop type things and she has taken our thoughts and (awful) scribbles and turned them into this lovely logo and design. We are both so impressed. So what do you think? Isn’t the cupcake logo just delicious? p.s. Check out Claire’s very own blog House of Clicks here. You’ll find links to her Etsy shop and photography website too (she’s very creative & talented obviously). Be nice she’s new to the world of blogging! One of my all time favourite meals is a roast chicken with all the trimmings, but for someone who writes a food blog, it’s a little bit embarrassing to admit that I’ve never made a roast dinner in my life!! This is particularly bad when I then go on to admit that growing up I ate a roast dinner every single week, yeah like I said it’s embarrassing to admit that I’ve never cooked one. Don’t get me wrong I’ve been there when someone else has cooked it – I’m not that rude! – in fact I’m usually the chief potato and parsnip twirler and bread sauce maker. But I’ve never even attempted to make one myself until a couple of weeks ago that is. My friend was coming round for lunch and having stupidly told her I’d never made one in my life, she made me promise to make one for her – eek!! So with that deal made I enlisted Lau’s help and we started researching recipes and trying to work out what to make. After a lot of discussion we ended up going for a ‘simple’ chicken, although I wasn’t sure how simple it would end up being on the day! 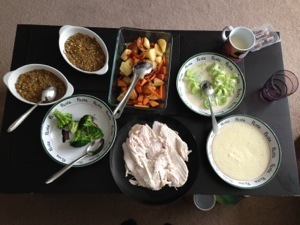 With our chicken we also made roast potatoes, carrots, broccoli, leeks in white sauce, stuffing, roasted sweet potato, gravy and of course bread sauce (my all time fave accompaniment). Everything ended up being super scrumptious and miraculously it was all edible (well apart from the brocolli as it was a bit hard) AND most importantly everything was ready on time – hooray! I won’t bore you with the recipe for each and every item but I will explain how we made the potatoes super fluffy and crunchy, the chicken super moist and delicious and also how we made the nicest ever carrots and sweet potatoes! 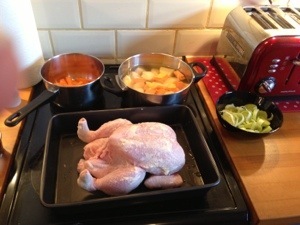 The Chicken – We used this wonderfully easy recipe from the BBC Good Food website for our roast chicken. It was really easy to make the chicken delicious and perfectly moist, we simply stuffed the chicken cavity with bay leaves, lemon halves and garlic and then rubbed the top of the chicken with butter and lemon. Easy peasy, well apart from stuffing my hand in a chicken – not my favourite job!! Super Fluffy Potatoes – Yet again we headed to the BBC Good Food site for help with our roast potatoes, see here. By adding the flour after the potatoes had been part boiled it made the potatoes nice and fluffy, so that some bits were extra crunchy and other bits were soft – perfect! Perfect Carrots and Sweet Potatoes – We part boiled both the carrots and sweet potatoes and then cooked them with the potatoes. This made them lovely and sweet and very soft. Plus because the carrots were so small each morsel ended up being really crunchy. All in all our first roast dinner went well – it was all delicious and not quite as hard or as complicated as I had imagined. So I think I’ll definitely be making one again, perhaps a roast beef with lovely crunchy yorkshire puddings next time. I realised recently that I’ve been lax and not shared my yummy recipes from our Disney evening with you – outrageous I know! I’m not sure what happened there, it’s like I forgot that you’d be waiting with baited breath for these recipes since Lau teased you with her first mentione of these lovely creations a few weeks back here. Sorry about that! But I’m rectifying that now with the following recipes for these scrumptious, super-easy pasta parcels and amazing, brilliant, delicious popcorn (to many superlatives? I think not!). Dollops of mac ‘n’ cheese – These are so easy to make that I won’t share the actual recipe with you I’ll just give you a couple of tips to remember next time you make mac and cheese*. This is the big one, this is the revelation that you’ll kick yourself for not doing sooner: Don’t put the mix in a normal big casserole dish, dollop the mixture into 12 cupcake cases – yes really! LIFE CHANGING or what?! But in all seriousness it’s that simple, just cook your mac ‘n’ cheese in a different container to normal and you’ll have the perfect mac ‘n’ cheese dollops that will be perfect for any meal – cold in lunch boxes, easy fingerfood (well plate and fork food) when you’re having friends round or even serve a couple with salad for dinner. Easy peasy and delicious. What more could you need? 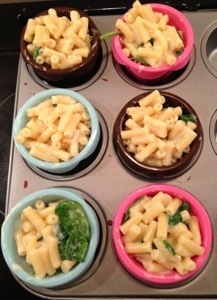 *We used about 500g of pasta and made 13 mac ‘n’ cheeses, which we baked for about 20 minutes. Disney Princess Popcorn – to be honest this wasn’t really a Disney themed food, I just put the word princess in front of it as I wanted the excuse of making popcorn, which I’m sure you’ll agree is essential for any movie night. 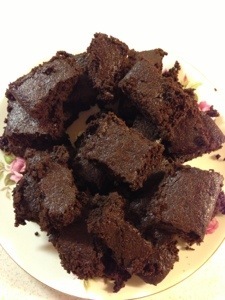 Another super-easy recipe here (I seem to be on a roll with the easy recipes today, don’t I? 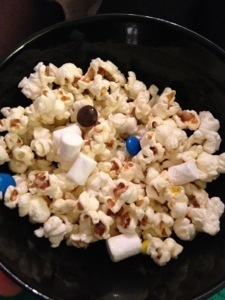 ), simple pop your popcorn kernels in the pan as instructed and then mix it in a big bowl with agave syrup, m&m’s, mini marshmallows and peanuts. Then as if by magic you’ll have super sticky, super scrumptious popcorn for all to share – pair with Disney films, good friends and Lau’s Minnie Mouse cupcakes and you’ve got the perfect night ready quicker than you can say bippity-boppity-boo!